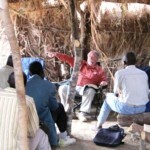 To establish a self-sustaining church anywhere in the world, discipleship is the key. New converts must be instructed in the Scriptures in order to obtain a Biblical worldview. This will allow them to filter their culture through the Word of God in order to bring their lives into conformity with the Scriptures, and to have a positive witness for Christ in their culture. In addition, our discipleship programs will be developed in order to develop pastors and church leaders who can examine the teachings of others and determine Biblically whether or not these things conform to Biblical truth. In the following pages and posts we will attempt to show you the discipleship programs as they progress at all levels.